Toe tips are mostly a fad. It is only in one case these shoes should be used, and that is in shoeing for contraction; but even then they are of little value, for if the heel, which is thinner, can stand the wear and tear, certainly the toe can. If in such a case the toe is poor the heel cannot be strong. In using tips the toe must have walls high enough to let the tips down, for in using these plates there must be a notch cut in the wall to receive them, and when the wall is high enough to be cut into for the tip, it is also strong enough to stand more wear than the weak heels. 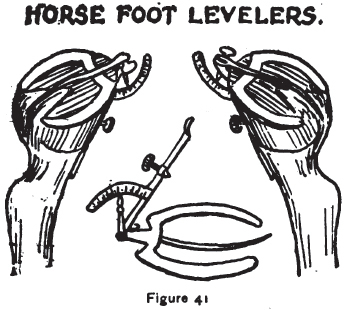 If a horse shod with tips is used on hard roads it will not be long before the heels are low and the toes high, thereby straining the back tendons. For contraction something else than tips must be used – an open bar shoe for instance, although no shoe at all is still better. If tips must be used in order to satisfy some enthusiast they should be made light, no over 3/16 of an inch thick, and then they should be set over often. Tips may also be the cause of seedy toe and quarter cracks, because of the notches made in the wall to receive these improper irons. Many owners of fast horses are very slavish to fashion. The latest! The latest! They demand, and no matter how injudicious. Somebody starts a fad and it goes the round. 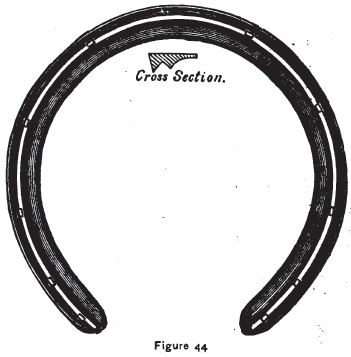 We hear so much about great improvements in horseshoeing, and it is to a certain extent true, but there is danger in overdoing it. The whims are liable to outnumber the sensible ideas, and I hope the day will come when a reaction will set in, and when it does come we shall see horses race bare footed, which will be a great improvement over many fatuous notions which are attracting so much attention at present. If we could learn how to raise horses with strong hoofs we would really have learned something. But we will never get strong hoofs in our horses by artificial living and shoeing. One of the most irrational whims is toe weight, whether it is in the shoe or in a weight on top of the toe. Nothing is more absurd than those slabs of bar iron, called toe weights shoes; but the whim demands this shoe, and the manufacturer, as well as the farrier, is ready to accommodate those laboring under the delusion. A man with the toe weight whim in his head is deaf to all reasoning on the subject. He will listen to nothing but toe weight. In his mind it is a cure-all, and he imagines that his horse could not get out of the stable without these irons. The tip is another whim. A man staggering under the weight of this fad would never think of entering a race without these faith-cure irons under the feet of his horse. I have even heard persons infected with the toe tip craze claim that toe tips would cure contractions, quarter cracks, corns and sprains, and, in short, that they would cure every ill the foot of the horse is subject to. The reason for this shortsightedness is twofold. First, selfishness; when a selfish or small-minded man makes a change is something it must be made to appear as important as possible. Second, most men are of one idea. When they get an idea in their heads there is no room for another. The bar shoe whim is bad; yet there are many points in favor of the bar shoe. A bar shoe properly made and wisely applied will do much good, but on account of this fact it is easy for enthusiasts to exaggerate its usefulness. One result of toe weight is laminitis, the result of which is a turned-up toe. Fig. 39 represents a foot that was ruined by toe weight. When the owner of these feet was three years old there was not a sign of any deformity. 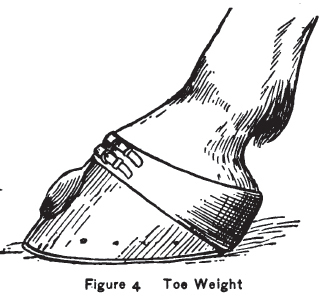 The owner of this horse caught the toe weight craze and he got it badly too, for he was not contented with a toe-weighted shoe, but also put on the obnoxious weight, which is sometimes fastened on the top of the toe. (See Fig. 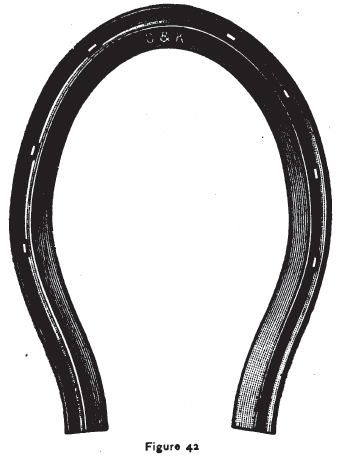 40) The result was that this promising horse became a cripple in two years, with a turned-up toe (see Fig. 39). And what else could be expected – a slab of iron under the toe, a weight of lead on the top of it, the horse put on hard roads to be trained and driven at a high speed that would crush the sensitive laminae in any foot! It is surprising that the result of this fad is land to other causes and not the real one. Still, it is useless to object, for oh, how little we know when these “great” horsemen bring a horse to us to be shod! We may have ironed horses for twenty-five years or more and studied and experimented, but we must appear to know nothing, for these “great” horsemen have heard something from someone, or read something about something, and of course they know it all, and the mechanic and artist of sixty must humbly submit to the wishes and whims of ignorant men and oftentimes boys not out of their teens. The first thing to be done in shoeing a trotter is to level the feet. One way, and a simple way, to level the feet is by measuring from the coronet down to the edge of the wall, at the heels and toe, and then marking with chalk to where the hoof is to be pared. 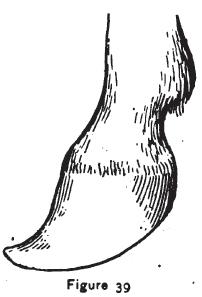 No arbitrary rule can be laid down for the angle of the foot; it must be found between fifty and sixty degrees. 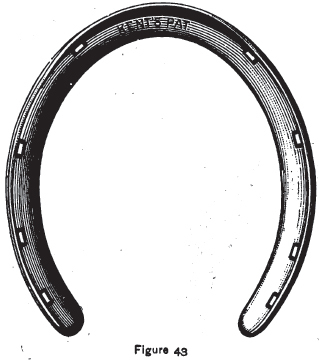 It is generally the rule that after the right angle has been found the owner of the horse will keep a record of it, and give it to the shoer when the animal is to be shod. For leveling and finding the right angle, a foot leveler is sometimes used. (See Fig. 41) It is comparatively easy to level the angle with such a leveler, but for finding the level they are useless. The foot being level, there is the guide for the making of the shoe. In Figs. 42, 43 and 44 racing plates, as manufactured by the Bryden Horseshoe Company, are represented. Fig. 44 is a light plate, and so are 42 and 43, which it is impossible for any smith to imitate by hand forging. From the cross-section it will be seen that the web is ribbed in such a shape that it is better than calks, and at the same time not so objectionable. I maintain that nothing is more ill-advised than smooth plates. First, because they are heavy, and then because they slip more easily than shoes made in the shape mentioned. These shoes are also of a uniformity impossible to attain in hand made shoes. For lightness they will suit every wish, as they come from 1 7/8 to 3 1/2 ounces. Fig. 43 is the shoe made in what is called Kent’s patent. This shoe has a smooth surface at the toe, just enough to weld the calk on, when calks are wanted. The manufacturer of these shoes also makes aluminum shoes, which in heft come near to nothing, weighing only 1 1/2 ounces. Fig. 42 is a shoe made of ribbed steel, a little heavier than the other and ranging from 5 3/4 to 7 3/4 ounces. These ribbed shoes are of such a construction that no calks are needed. They give a great bearing surface to the foot and a narrow striking surface, preventing concussion, which is greater in a shoe with a wide striking surface. It also gives a sure grip, which is not the case in shoes with a flat striking surface. This shoe should be fitted to the edge of the wall, so that when the shoe is nailed, there need be no rasping. Use small nails and do not rasp a crease in the hoof under the nails for the clinches, but remove the chip forced out by the nail with a chisel. Trotters’ feet should be kept moist in dry weather with hoof ointment or packing in boots.